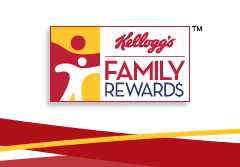 Home > Free > More Kelloggs Family Rewards Codes = Coupons! More Kelloggs Family Rewards Codes = Coupons! Have you signed up for Kellogg’s Family Rewards yet? After you register, start entering codes from participating products and various codes found online and you’ll earn coupons and gift cards! Codes in bold are new since our last posting. So far I’ve gotten two .50/1 any Kellogg’s Cereal or Pop Tarts coupon and a .60/1 Kellogg’s Cereal coupon. With stores that double in my area these were very fun surprises!